Now that the dust has settled after October’s Federal Election, I was curious as to how former York South-Weston Member of Parliament, Mike Sullivan was adjusting to the new reality of being a regular citizen once more. He agreed to an in-depth interview and we sat down last Friday over coffees in a busy Perfect Blend Bakery. We touched on four main topics that have been published over the last few days. The fourth and final issue that we discussed was Weston’s recently closed hospital. The Humber River Hospital’s three campus locations have closed to be replaced by a brand new hospital at Wilson and Keele. In preparation for the closing of our local Church Street site, the Hospital Board went ahead with plans to sell the site to the highest bidder. Some people then pointed out that a significant chunk of the original site was a bequest with the proviso that the land would be used for a Weston hospital in perpetuity. The matter is now before the courts. The Church Street Campus last August before it closed. What should happen is the Province pays the appropriate price for the property and turns it into a long term care facility which they have already done in Parry Sound and Ottawa and other places where hospitals that have been decommissioned have become long term care facilities. According to (York South-Weston MPP) Ms. Albanese, it’s not as simple as one arm of the province buying the hospital from another. She said that the hospital is entirely run by a private corporation that has nothing to do with the province and that corporation can do whatever it wants with the land. Martin Proctor challenged her strongly on this at a meeting and pointed out that it was the folks in Weston that contributed and added on to that hospital over many years and now they are losing that resource. What appears to have happened is that the Province has separated itself from hospitals by declaring them corporations run by an independent board who the Province then paid 2 billion dollars to build a new one on the understanding that the board would raise 200 million of its own by selling the land and other fundraising. The province can correct its mistake by saying that the land which is worth about 20 million can be forgiven to the Hospital Board of Directors and the province take over the property but Ms. Albanese wasn’t going there. They’ve got to build long term care facilities anyway – somebody has to. There’s a 1 year wait list for long-term care facilities and people will die on that list. Why are we ignoring a great potential? I understand that the Province wants privately run long-term care facilities but surely if the land is available they can find a developer who is willing to do that. I spoke to Rueben Devlin (HRRH CEO) about that possibility and he told me it could never be a long-term care facility because the rules are so strict it wouldn’t meet the current standards. But then how did they do it in Parry Sound and Ottawa? The province has grandparented other buildings why wouldn’t they do that in Weston rather than tearing it down and building a condo tower. SuOn College is very interested in the site. They’re bursting at the seams and are looking to expand. There would be no rezoning needed as it is zoned institutional. The fly in the ointment is that the city owns part of the site and the hospital was very quick to go to court over that and are suing the city to try and keep title of the land with the Hospital. Frances had a plan for some kind of trade that would allow the city to keep some parkland somewhere in exchange for the land. Her wonderful deal with Cruickshank Section 37 money didn’t buy a community amenity – it bought drainage in Swanek park which the City was going to pay for anyway. I contacted York South-Weston MPP Laura Albanese and she confirmed that currently the site is zoned institutional. She also confirmed that hospitals are not fully funded by the province but communities are expected to have an investment in their hospital by raising 10% of the funding. The sale of the Church Street Site would go towards that community contribution. Under the current setup, long term care facilities are managed by not-for-profit corporations, indirectly connected with the Ontario Government. In order to use that as a solution, there has to be an expression of interest from such an entity and to date there has been none. She also mentioned that until the ownership of the deeded land on the HRRH site is settled, nothing is likely to proceed. She did say that the Keele Street Hospital Campus has been sold to developer Daniels Corporation and the plan is to build some institutional facilities along with low-rise housing. Having a similar outcome for Weston probably wouldn’t be too terrible, but who knows – with the way things are done in this city, the vision, accompanied by beautiful architectural drawings and the reality are often two entirely different things. Can you say Weston Cultural Hub? Thanks to Mike Sullivan for agreeing to do this and to MPP Laura Albanese for her response. Author Roy MurrayPosted on December 24, 2015 Categories Healthcare, Humber River Regional Hospital, Opinion, Real estateTags HRRH, Humber River Regional Hospital, Laura Albanese, Mike Sullivan1 Comment on Sullivan: Weston’s hospital site. Weston residents are upset about the potential sale of the Humber River Regional Hospital, says InsideToronto, in a long piece. 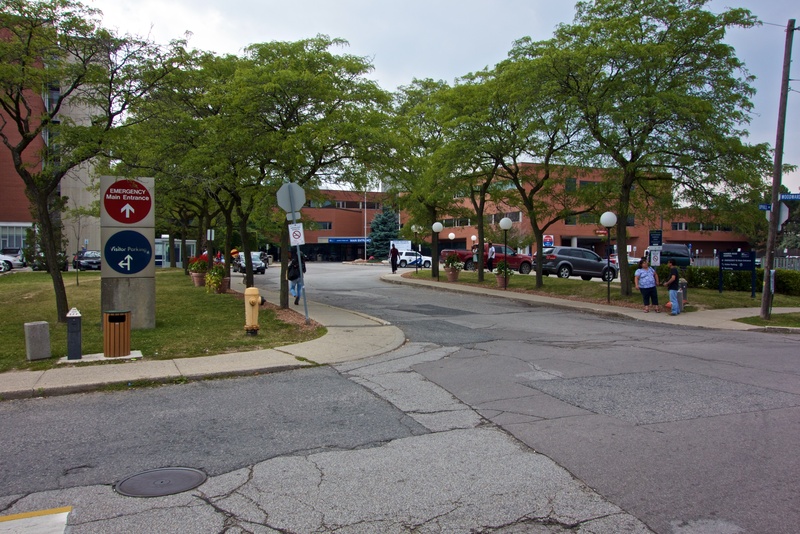 The councillor hosted the meeting to update the community on the court process, saying the city intends to stake its claim to the 1.25-acre portion of the hospital’s 11 acres of land located on Church Street. The Town of Weston had sold the 1.25-acre parcel to the hospital in 1948. Laura Albanese, however, was “grilled” by the audience for the province’s part. This week (Monday) we will have a meeting concerning the land, some of which was donated to the town of Weston for what became Humber River Regional Hospital back in the 1940s. We will also have a residents’ meeting (Wednesday) to hear citizen input regarding the Weston Hub on John Street. In both of these cases, taxpayer funded entities sold or are looking to sell valuable public land to developers. The Toronto Parking Authority sold off the old GO Station parking lot with little fanfare and now HRRH effectively wants to sell its entire site to developer/s. I would guess that those same citizens of Weston aren’t cheering about a 31– 30 storey* rental tower on the old GO parking lot but it looks like they’re getting one. Why is the HRRH site any less vulnerable? Answer: it’s probably not. As the old saying goes, there is only one taxpayer. Why are (often hard fought) public assets compromised by the need for taxpayer funded agencies to raise cash? Surely our cities deserve better and more deliberate planning than this? One more thing… Farmers Market traders have been concerned for a while that because their new site is so much smaller, they won’t have room for their vehicles. Superimposing the approximate new space allocation (black line) over a satellite view of the Market in full swing is quite telling and may explain traders’ anxiety. This much smaller space may work well with stalls selling selling pickled artisanal mushrooms and the like but it probably won’t be the same for many of our current traders who need their current freedom to spread out. 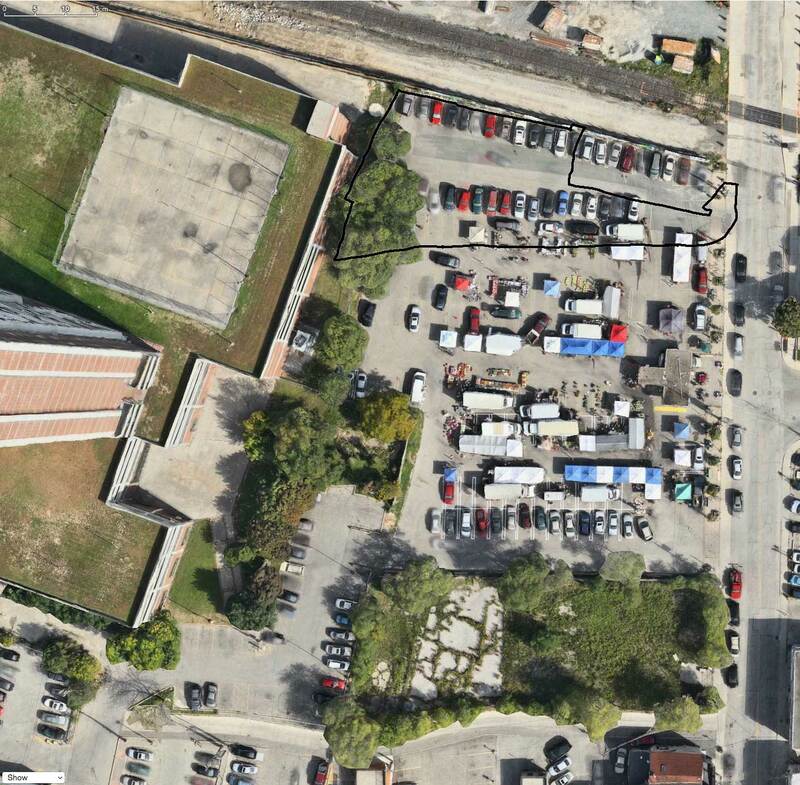 Farmers Marketl space allocation (black line) after the Hub is built. Parking may be an issue too as that will be in the lower part of the green space at the bottom of the image. *Update: Etobicoke York Council minutes have changed (from the original agenda) to now state that the Hub rental apartment will be 30 storeys. Hopefully it was just a typo on the part of clerical staff. Frances Nunziata posted some really interesting information to her email circular earlier this week. The Humber River Regional Hospital remains unable to sell the old building, which will be empty starting in October. The building is unsellable because of the termsof an old deed. The issue will first go to the courts. The HRRH wants the hospital to be sold free and clear. The city’s lawyers will be arguing that we are entitled to the land. Toronto Police say that a woman was killed in an odd, single-vehicle collision at the Humber River Regional Hospital on Sunday. The police say that an 81-year-old woman drove through the parking lot then hit a building. The driver “suffered life-threatening injuries and was taken to hospital for treatment” where she was pronounced dead.